I have been predicting wars over water since the early nineties and thought it might be worthwhile to look at how much water we need. If I was still giving assemblies, this would be a topic. There is a need for around 3 litres of water per day per human, varying with exercise and body weight. That is not at all the same as the consumption of water. In Britain what comes out of the tap is the same stuff that washes the clothes, flushes the toilet and waters the garden. Our house in Cornwall had vestiges of a two-state system, where water from the sky was for washing and flushing, saving tap water (from the onsite well) for food. Beijing has been unbelievably dry - not that anyone would admit to anything like drought. We were up in the hills just outside the city (and the province) and we had great difficulty finding water—none on the ground at all, even drier than the African Cape—so had to carry water in quantity and then journey into any village to find bottled water. This week, however, the skies darkened (Weds - Fri) and it has been gently wet (not even Irish damp) since Thursday. Today, Sunday, it has decided to rain properly since early morning and I see (now, having sought information) that the rainfall for Beijing comes in the summer. That now explains the flood measuring board under the elevated metro line I cross on the way to school. It also causes the pollution to fall dramatically and we have clean air today for the first time in ten days. I will argue with anyone that says clean air is a right. Air might be, but breathable air is a wish, not a right. This country is capitalist in ways one cannot easily fathom from within Britain and, when coupled with the selfishness that you'd expect and the continual seeking off immediate advantage [in China] that is more of a surprise, means that there is no perception of a need to clean up any act (from littering to polluting) and indeed there are arguments that say this is the only way we have employment, by continually creating work….. so the littering (etc etc) continues, messed (with, about) by the powers that be. Of course if you want it to stop, you'll have to put your hand deep into your pocket, so we already recognise that we have a (clean) air tax, called the private citizen's air filter, his or her collection of face masks and the loss of profit to afford air cleaners at work. All we need now is a way of making the cleaning of air a domestic manual chore and we're all set for 2020….. Looking at occasions where access to water has been the cause of conflict, I immediately hit issues of access over (to and over) the internet (how odd; what am I missing?). Around the world, the Institute has fingered more than twenty conflicts and potential conflicts concerning division of river flows between upstream and downstream users. These range from tensions within China over the Yangtze to discord between Mali, Niger, Nigeria, and Guinea over the Niger and between Iraq, Syria, and Turkey over the Tigris and Euphrates. Even the United States is on the list: The United States and Mexico have long squabbled over the Rio Grande, Rio Bravo, Rio Conchos, and Colorado systems, all of which rise in the United States but are crucial to northern Mexico. By 2050, the world's populations will be a third to a half again as large as today, with the biggest factor driving water consumption not being the home, school, or workplace tap or even industrial processes. Seventy percent of the world's usable water is consumed in agriculture—growing and raising our food. Population expansion is only part of the story. Among the most hopeful international developments of the last 40 years has been the incredible drop in extreme poverty, by half. And despite the worldwide economic downturn, vastly more people are middle income or approaching middle-income status than was conceivable in, say, 1980. India's "middle class" exceeds in size the entire population of the United States. China's story is even more stunning. And in the past year there has been talk of an African economic take-off, something beyond many imaginations just a decade ago. I dislike sentences that start with ‘and’; it is an effect to use sparingly. And therefore rarely. Twice in the same paragraph? Poor writing. a 1992 study of 186 societies, most of them pre-industrial, by the anthropologists Carol and Melvin Ember, found no evidence that scarcity of food, water and other resources leads inevitably or even usually to violent conflict. As I explained a year ago in a column on the Embers’ research, the strongest correlate of warfare was a history of unpredictable natural disasters—such as floods, droughts and insect infestations—that disrupted food supplies. The Embers were careful to note that it was not the disasters themselves that precipitated war, but the memory of past disasters and hence the fear of future ones. Another correlate was a society’s distrust of neighboring societies. “Fear appears to be a common thread in the two obtained predictors of wars—fear of nature and fear of others,” the Embers concluded. Scientific American concludes from these several points that wars over water are not inevitable - perhaps water is too important to go to battle over and so a settlement is more productive. Whether or not we actually go to war doesn’t get away from issues of growing demand for water. The bittiness of this ‘essay’ is a feature of the timing of the research done. I started to write much too soon; I discovered that each piece of writing raised new points (of interest to me) to chase and I’m afraid the result reflects that rather more than it should. In the sense that this then reflects the rambling style of a School Assembly - where the point is to stimulate some thought, not provide answers - then this is an honest portrayal of a problem. If you were looking for incisive thinking, I apologise. Or perhaps I don’t, because I’m trying to encourage you the reader to think far more than I am to make myself do it with the written form - far too much rewriting required. For example, I like that I start with an assumption that there will be wars over water and then find that these are rarely directly attributed but that water shortage and war are still correlated. Clearly, demand is rising steadily as the wealth of people rises and particularly as the number of people who are sufficiently affluent to choose what they eat rises. Looking at the News Opinion content you might read some of the background papers, like this one, of which I have read a lot. The average person in Britain uses 150 litres of water per day⁴, but when hidden factors are included, that increases 30-fold to 4645 (Guardian again, this time here, Aug 2008, and 4 figure precision is seen my me as doubtful). The hidden consumption is what happens when we account for consumption of water in other countries while they generate products we purchase. That might well be a red herring, since any such country has chosen to use water to convert this to produce (production, income). Perhaps the justified element of such an argument is that countries using water for production are in greater need for that same water than is Britain. That then means that the sensible, environmentally capable company is directing effort to encouraging produce and production from places where the use of water makes sense - but that smacks of Mummy knowing better and is a bit PC; I’d like to see that change to encouraging producers to grow or make things that the customer feels is appropriate. Which takes ideas of fair trade to a whole new level, where it works. And where it doesn’t, drives a new set of nails in. See? Emphasis effect in starting with ‘and’. British water consumption might be 150 litres/person/day but that is domestic, household consumption. Domestic consumption has 1/3 down the toilet, 1/3 in showers and baths. A shower takes 40% of the water for a bath. See here for ideas and figures from Welsh Water. Those figures include telling us that only 3% of the world’s water is not salty and 3/4 of that which is available is frozen, leaving not a lot to go round (relatively). Britain uses 70% more than it did 40 years ago, which figure will be driving expectations of consumption elsewhere in the world. Welsh Water tells us that around 95% of what is pumped to houses goes down the drain (so it is available for recycling, isn’t it? I seem to remember that SW Water lost more in leaks than we drank). It is Welsh Water that is telling me that the water table in Beijing is dropping 2 metres a year. They also tell me that in the developing world the average consumption is 10 litres per day for drinking, washing and cooking. Total consumption figures can be found at Worldometers, from data compiled by the UN and that tells us in nice round numbers that 70% of all consumption is down to agriculture, 20% industry and 10% domestic. Belgium, for example, uses 80% of its available water for industry. • Changes in lifestyles and eating habits in recent years are requiring more water consumption per capita. • The production of biofuels has also increased sharply in recent years, with significant impact on water demand. Between 1,000 and 4,000 litres of water are needed to produce a single litre of biofuel. • Energy demand is also accelerating, with corresponding implications for water demand. What we are missing is some suitable vocabulary, relevant information and some sane reasoning. 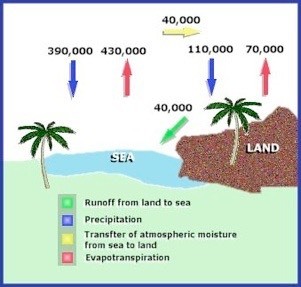 The water cycle moves it around from evaporation to rain to rivers and back to the sea where it evaporates again. Our fuss is over the opportunity to make use of the stuff. Our biggest opportunity surely lies in using rainfall and second by abstraction from rivers as they transport water off to the sea. Trying to check that last statement has proved far harder than I expected. We hold water for use in reservoirs and lakes. There is groundwater of two types, based on the length of time it has been underground; that which fell relatively recently and that which is ‘fossil water’. An example (the best one) of the latter is the Nubian sandstone aquifer⁷ which lies under Libya, Chad, the Sudan and Egypt (that’s the northern Sahara to me, but I’m wrong because the aquifer is mostly under Egypt). The volume is over half a billion cubic kilometres; that’s seven times bigger than the Caspian Sea, the largest inland surface water body of water (paraphrasing one of the UN papers referenced above). What is special about fossil groundwater is that it is seen as being non-renewable, though they may be managed in a renewable way (meaning take an awful lot less out and do a lot of work to find out how water gets down there. I’d like to be told that chucking seawater down the hole would result in fresh water to be tapped, but the chemistry can’t be so simple, can it?). Water in rivers is also fed by glaciers. We know these are reducing steadily, so that is raising flows temporarily. (ungh? Yes, the extra melt adds to the water flow but having less ice up in the mountains means that the future flow will not have the previous melt added to it, okay?). So that source is reducing steadily and we probably have a false local feeling about that. There’s a phrase in use, water stress, which is state you have when there isn’t quite as much water available as you’d like. I found a figure of 1700 cubic metres per person per year, which doesn’t seem like a lot, actually. 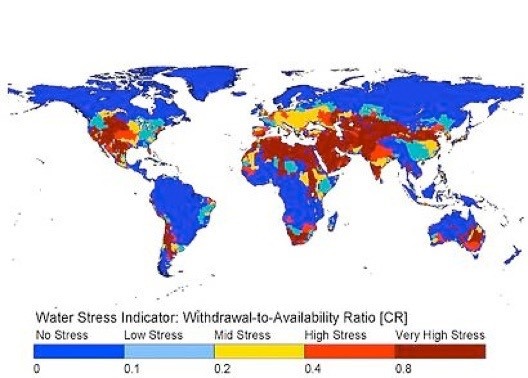 Water stress occurs when a nation is using 60% of its accessible water. Take care with that description; accessible doesn’t mean just rainfall or river water, but what they (you, us) can actually make use of - a strange idea. Diagram adjacent from here. Decent article on water stress here. If interested in more, hunt for Nigel Arnell, 2004. One of the big insurance companies [citation(s) missing] reports that great natural catastrophes have trebled since 1950 (that might reflect a change in attitude to insurance). My reading says that there were six times the number of displaced persons as a result of natural catastrophe compared to the 25-30 million (per year) displaced by conflict, but that might be partly a reflection of perceptions of the difficulties of travel. Fifty years ago (as of 2010), the common perception was that water was an infinite resource. At that time, there were fewer than half the current number of people on the planet. People were not as wealthy as today, consumed fewer calories and ate less meat, so less water was needed to produce their food. They required a third of the volume of water we presently take from rivers. Today, the competition for water resources is much more intense. This is because there are now more than seven billion people on the planet, their consumption of water-thirsty meat and vegetables is rising, and there is increasing competition for water from industry, urbanisation and biofuel crops. To avoid a global water crisis, farmers will have to strive to increase productivity to meet growing demands for food, while industry and cities find ways to use water more efficiently. It is tempting, given the vastly different amounts used in agriculture to household domesticity, to say “This is not my problem”. But it is, at whatever local level or level of locality you want to apply it. Just in Britain we have talked about moving water around the country (a National Grid for Water) but we recognise that project is hugely expensive as water is quite heavy, So water is a local problem and mostly we have enough, always. We talk about drought, meaning “Don’t throw it on the plants” - because the wider ‘we’ can’t afford that. Catching rainwater (before it goes into the system) and using waste water—again, getting another use before it goes into the waste system for reclamation—makes a lot of sense. Processing, providing and using different classes of water (drinkable, suitable for washing, suitable for flushing away) makes huge sense. Elsewhere in the world, providing clean water to diminish the huge losses to water-borne diseases is a fine and worthwhile objective, but it needs to go with education and population reduction. We’re looking at having 2 billion more people in the next twenty years. There is a sense in which we cannot, as a race, afford such increase. In that sense, we don’t need more people, so there is an argument that says helping more people survive is counter-productive for the race a a whole. Many people find that logical but the very idea sits uncomfortably alongside fixes and actions that would relieve suffering. This is where the biological striving to keep the race going is in conflict with diminishing resources. Enough: off the soap box. The most helpful site I found, after Welsh Water, was this one, Global Change, which includes a pretty picture I copy here. Units are cubic kilometres, and the originator is someone called Gleick. Given increasing population (and demand per capita) and decreasing supply (from contamination and pollution) it would seem to me obvious that we need to look at finding some more to have in circulation. 75% of the available fresh water on the planet is locked up in ice, so suddenly the melting of the ice in Greenland looks like a different sort of disaster - it’s going into the sea, not where we need it. And that is really the problem we can tackle; we have water, but it is not where we need it. We waste water all the time; we don’t manage it very well. Therefore we need to change our attitudes, and it doesn’t matter where we do that, as long as we do do that. We need to recognise that it will take time to change everyone’s attitude, so we should start with ourselves—it is a change of culture that is called for—being aware that water needs to be used while we have the opportunity. We need to change our systems to accommodate classes of water and its usage; we need to understand better how we do use and could use water. That includes abstraction, returning water to the water table, recognising the cost of using water in a different country and the possibilities of using (especially) salt water. An awful lot of the run-off (the water we have access to) is inaccessible (ideas from Global Change say 95% of the Amazon, 50% of the Zaire, 95% of the large northern rivers); they estimate 20-25% is actually accessible. So there is a lot we could do about that, by moving people to where water is, or by moving water to where people are. Finding more water seems a no-brainer; we can see it quite easily. What does not yet make sense is the cost of moving freshwater ice to were we need it, nor the cost of generating freshwater from seawater. We do have water, but it is not going to be (quite as) free. Similarly, potable water will become steadily more expensive unless and until we get our other acts together far better than we have to date. Obvious improvements: (i) more effective irrigation (perhaps 60% wasted there, so 40% of all abstracted water) - lessons available from Israel to the whole of the Arab world; (ii) water is often underpriced (I’m quoting Global Change again); freeing up the market would cause efficiencies to occur. On a local level, Beijing is a very large city sitting in a very large dry place. The rain that falls in the hills often doesn’t reach the river and the rivers in China often don’t reach the sea. China has the capacity to do large and radical things such as gross movement of population – to somewhere warmer and wetter within the country, for example. Much of China’s agriculture is still a long, long way behind western systems, being little more than feudal peasant farming in many places. Changing that will require more water before it requires less and we may well hit another famine while waiting for such change to occur. Meanwhile, it continues to rain – the forecast is that it will rain all through tomorrow too. This is a good thing. Edits yet to occur. I’m having trouble with the keyboard, especially the spacebar. Also trouble with the old dyslexic fnigers (sic). I tend to return to a page and rewrite it a week or so later. Essays 112 and 113 changed today with editing. Footnotes not completed. Dinner time. Some edits 20130814. Caps mainly fixed (new keyboard). Fnigers not replaceable. The picture at the top is the default one for new pages in iWeb, of a young lady surfing. It can stay there. 1 Oldest Cris is in California, having been a colleague at several sites in China. Old Chris is in Cornwall, only recently retired and living a life of activity that many 30 years younger have given up aspiring to. His son is Young Chris, rapidly ageing due a diet of beer. 3 See here for comment about age-related tendencies, arguing a bit with the 64 fl oz/day figure. That’s 3.2 litres. See Global Policy Forum ‘Water in Conflict’. 1.30.M. A. Levy, C. Thorkelson, C. Vörösmarty, E. Douglas, and M. Humphreys, “Freshwater Availability Anomalies and Outbreak of Internal War: Results from a Global Spatial Time Series Analysis,” paper pre- sented to the International Studies Association March 22–25, 2006, San Diego. 6 In the hotel business, one has space for rent on a daily basis. Thus it is quite possible that you could argue your way into the use of a room that would otherwise stay empty for significantly less than the announced rate. I think there are cases for hotels offering reduced rates for a second or third night, and for people that turn up late. In the same way, water is generally travelling downhill, even in a reservoir; if we’re gong to make use of that water, we have to do it in a temporal manner, while it is available. What would be smarter would be managing to make many uses of water. One of the complaints about farming is that irrigation is a very inefficient use of water. Surely, though, that water mostly goes back into the water source. Certainly, evaporation is increased if the surface area is increased. Data required - help, please. 7 footnotes not in order. Aquifer means water-bearing rock that can be tapped. New vocabulary includes aquitard (low permeability), aquiclude and aquifuge (an impermeable layer such as clay above an aquifer). Aquifers near the surface (<200m) will be topped up by rainwater. Obviously what this is is a store of water and we can’t take out more than goes in (not for long, anyway). What is likely is that rain falls in mountains and the water slides into the aquifer where we can extract it later, like when it is not raining. Aquifers do not necessarily have fresh water; they may be saturated—and therefore have greater than atmospheric pressure—or unsaturated, with air pockets (or other stuff) and the material is sucking. Water lying in ground above an impermeable (again, clay) layer is ‘perched’ (it could disappear if the clay layer was breached). Aquifers might very well have flow and indeed could be underground streams. There’s a large aquifer under Australia at around 1.7 million km³. The Nubian one was 500 million km³ before Libya started emptying it. Ogallala, central US, is shrinking steadily (I found a volume figure of 1 million billion gallons, which might be 4500 km³ - please check that)), with something like 25 years left at current abstraction rates. The water at Edwards, Texas, not dissimilar from the air base, is special because it is renewable, provided we don’t over develop the area. The problem is that the recharge rate is very slow; the experts in dating water are, surprisingly, Atomic Energy specialists. American recharge rates range between 0.6mm to 150mm depending on location, but abstraction is measured in metres. It is not immediately obvious, but only the vertical dimension is of interest; However much there is, what is of interest is what the level is (or perhaps the depth), so the important thing to measure is how that level changes with time. It seems to me that the US will be the first to reverse the falling trend, if anyone succeeds in that. There is some interesting reading to be found on this topic. 20181023 Edit: This source has an interesting article about recovering water from the atmosphere, saying While atmospheric water only accounts for about 4 percent of freshwater on Earth, it’s far less energy-intensive to extract than glacier water, which account for about two-thirds of Earth’s fresh water supply. It describes (and points to others) how this extraction can be done and how that might work economically. Put in the context of describing water vapour as a greenhouse gas, then extraction could be seen as good to very good.